"I should not exist. But I do." I received the e-book to review from NetGalley. I also have my own physical copy that I purchased from a local book shop. I have heard so much about this book, and was very excited to read it. The synopsis on the back of the book caught my attention straight away. This is the first novel I have read from Kat Zhang. It's is the first book in The Hybrid Chronicles series. The story is told from Eva's perspective which I thought was interesting as she isn't the dominant soul. You really can feel and understand her thoughts and feelings. I really did feel sorry for her. The opening paragraph even made me connect with this character. The other soul Addie is a more spunky character. At times, she does come across as a little it selfish and annoying like she prefers to remain being the stronger soul. Eva I like more because I admire her determination to remain in the body and not argue with her other connected side. I really liked the friends that Addie & Eva discovered, and their connections were really strong. I really felt anger towards all the doctors and nurses when they said Eva needed to go. You develop such a liking for Eva, you feel like you want to fight for her survival. I thought the relationship between Eva and Ryan was so cute. I was like "awwh". I thought the storyline was strong, and it had me hooked from the beginning. So much was happening, but I wasn't confused and was following with ease. I haven't read a book with this type of story before, so it was a risk in giving it a go, but I'm glad I went for it, as it was an enjoyable read. I enjoyed the theory behind hybrids. The font is easy to follow, and it's simple to know when a particular soul is speaking. The chapters are fairly short, and the book has a total of 343 pages. Although it may seem a chunky-ish book, it was actually a fairly quick read. I really like the cover to this book; how you can see half a face, which is portraying the half soul, and it leaves the other side blank, so mystery is held there. 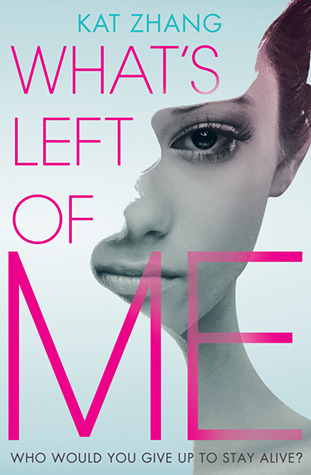 The tag line on the front cover - "Who would you give up to stay alive?" - draws you in. Overall, I'm going to give this book five stars because I thoroughly enjoyed the storyline, the characters were well developed, and I was hooked from the beginning. I definitely recommend as it is a really good read. If you like stories with mystery, souls and romance involved, then give it a shot.